Last year, I bought a bunch of different potted flowers to brighten up my dull garden. I bought red dahlias , yellow calla lilies, and some other flowers that I can't recall at the moment. I alwiz envy you wonderful people living in places with temperate climates. The flowers there are so beautiful. I alwiz felt so happy during my visits to Cameron Highlands coz I get to see all those wonderful blooms. I am sorry you lost your bet. I just hope that you won't give up on it..I really wanna see your roses one day! @Gwei Mui - Thanks, now I know what those fuzzy ball is. I always blow on them whenever I see them in parks and now my little girl blows on them in our backyard when it's in full bloom. I have these weeds in my backyard too. 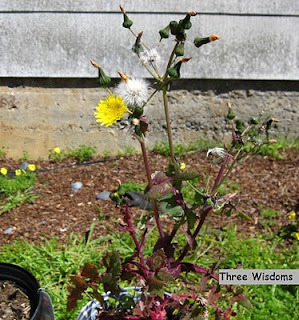 Have you heard about dandelion salads? The leaves from this plant is used. I haven't tried it only saw it once on a menu. Ah dandelions! They are starting to pop up on my lawn now. Sorry about losing the bet! My kids always loved to "blow" on the fuzzy white stuff and watch it blow away! The last flower in your photo is a kind of weed around here, and I have some in my backyard. They are very beautiful as well..
@Icy BC - Thanks for sharing this with me. The bulbs in your picture is round while mine is somewhat oblong and has this thing coming out in the middle. I think they are beautiful flowers too, very low maintenance, grows well in dry soil as I don't water this pot often and the flowers bloom continuously. On the bright side, no one will ever ask you to weed their flower bed! 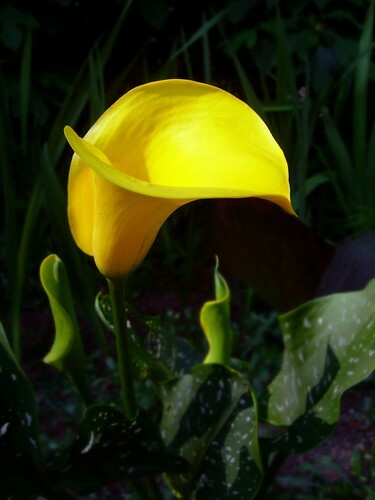 That yellow calla lily is so lovely! I love calia lilies. They are so beautiful. In fact, I love almost all the flowers in the lily family. I'm also a big fan of lilies. Sorry about losing the bet!! Oh, LOL, I bet she just loved rubbing that in!! Haha wow, I'm clueless when it comes to Botany too. So I guess my future house would look all concrete with a flowerbed or a pot of plant. LOL. Hope you pick the right one for your sister. Hi there, thanks for visiting my blog :) Sorry but I just had to laugh out loud at that dandelion flower. Your sister must be rubbing it in. Ah well, it just goes to show you're optimistic, which is a good thing. Thanks for swinging by. I was looking for some sardine recipes and came across your post on sardine sandwiches which I haven't had for such very long. Oh dear, the yellow lily is so nice! That one is the new bloom too? Love it! I'm glad your lovely flowers rebloomed. I certainly don't have a green thumb so I applaud you on your efforts. Heeehehehe! Your too funny with your pot-o-dahlias! I have four of my grandkiddos tomorrow through Saturday and I'm sure they'll be blowin' and replanting my yard in dwarf yellow dahlias for next year! Ya'll have a wonderfully blessed Wednesday!! !